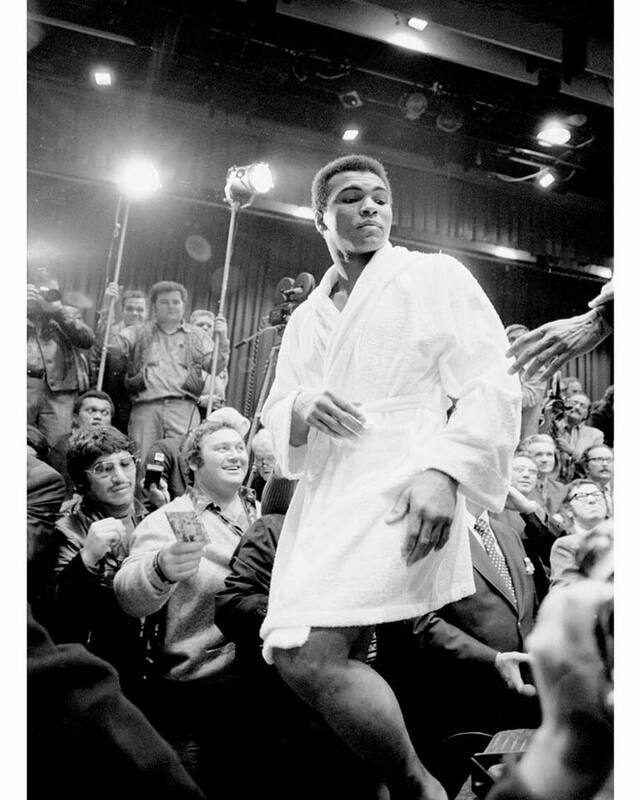 There are as many Ali stories as there are people, especially photographers, who ever met him. I covered a couple of Ali fights from the nosebleed sections, but it was never so much the fight itself as the days leading up to the fight, that his spirit and personality were so evident. In Kuala Lumpur, in the summer of 1975, just weeks after the end of the war in Vietnam, Ali fought Joe Bugner. I’d been doing an East Asia swing through Korea and Hong Kong, en route to Thailand, when it seemed like stopping in KL made the most sense. Ali fights were those kind of events which were captivating in a way that is impossible to describe to a kid who has had a cellphone in hand for his whole life. The mid-70s was still the land of Telex, letters written by hand, and the very occasional trans-continental phone call. The media, such as it was, consisted of weekly magazines (Time, People, Newsweek), the dailies & wires, and the TV networks, with their 16mm sound cameras. It all seems so quaint in the world of instant everything high-rez on your wrist. The reason it worked, of course, was that there were no other options. The technology of reporting was, by today’s standards, very primitive. Which made Ali’s world-wide reputation all the more amazing. There is no question that in 1975 Ali was the most recognizable, most “famous” person on the earth, and I suspect he kept that title for many years. A year later, branching out after most of the boxing giants had fallen to his jabs, Ali decided to fight Antonio Inoki, a Japanese wrestler in what became one of the first true Mixed Martial Arts matches, at the Budokan in Tokyo. The whole match, Inoki kept dropping to the mat, trying to scissor kick Ali’s legs. Ali never really had much of a chance to lay on one of his punches, since his target was in that very unfamiliar territory. Rick Smolan, who was still on his first big Asian trip (which would last several years) and I covered the fight for Contact Press Images as best we could, and were happily surprised the next day when we were met in our hotel lobby by the Korean tae-kwan-do impresario Jun Rhee, who said, with great excitement, that he’d convinced Ali to bring his entourage to Korea for a couple of days, and would we like to accompany them? For Rhee, it would be an enormous feather in his hat (already famous for his many tae-kwan-do parlors in the Washington DC area) to pull off this Public Relations master plan. I’m sure the Ali entourage was highly paid for their couple of days, but at the same time, he wouldn’t have gone if he didn’t want to. I believe Ali was always looking for new ground to see. In the mid-70s, just two decades after the war, Korea was just beginning to become the highly industrialized tech giant it is today. After a quick round of telexes to New York, I found I had a People assignment, with the proviso that I also do the reporting. I’d been with a lot of reporters, but actually formulating, and asking the questions wasn’t my strong suit. On the plane to Seoul I cornered Ali for a few minutes in the front cabin (one thing you have to say about Jun Rhee, he was generous!) and after telling me how sore his legs were from being bombarded by Inoki’s kicks, there was a brief lull. I think I then threw myself on his mercy, and said “Champ, I need a good quote for this piece, can you help me?” … and though history doesn’t record (I can’t find the notebooks!) the actual quote, I was at least able to file for the story from Seoul. More amazing by far, though, was the welcome in Korea. From Kimpo to the center of town, the road was clogged, yes, clogged, with people six deep, all wanting a glimpse of the the most famous man in the world. Excitement was in the air. He spent a day at Camp Casey where the US troops were barracked, near the DMZ, and did an exhibition match in an Army ring with a couple of the base champs. It was, above all, a chance to see the depth to which his presence could energize a place. 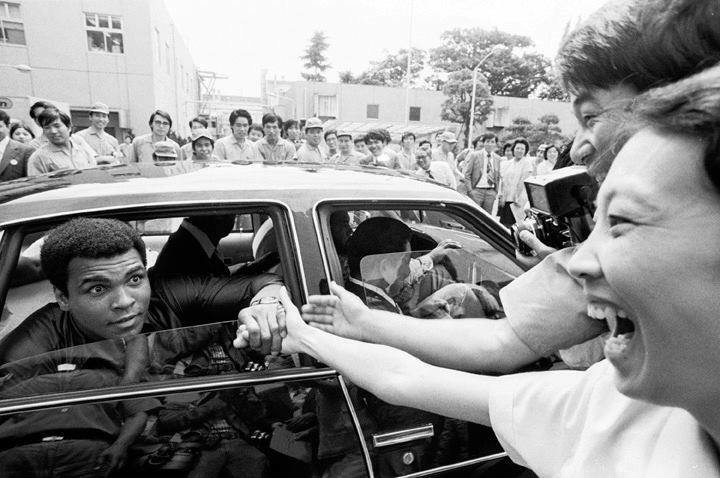 As in KL the year before, Seoul became completely overcome with the simple joy and energy of having the Champ in town. I have always been rankled a bit by the fact that I didn’t just get myself to the Thrilla in Manila or the Rumble in the Jungle. In today’s world, where communications is so prevalent, and yet so little is often being communicated, those were the kind of trips which were absolutely rich for writers and photographers. And Ali was the once in a generation kind of talent who could actually back up what he said, thereby turning bragging into simple fact checking. Ali was his own social media. He certainly didn’t need Twitter or Facebook. He was the medium. The last time I saw him was through a 400mm lens as he held the Olympic torch twenty years ago in Atlanta. There was nothing in his Parkinson’s affliction that could interfere with the glory and presence of the man, and I suspect a few tears might have been coloring the view in my finder. I consider myself lucky to have lived in the time he was Champ.